When I first started airbrushing [garbled text] years ago, I was thrilled with my single action airbrush and pressurized air cans. These got me through my early days in the Air Force, though I learned a bitter lesson about those air cans when I heard a loud bang come from my parked VW Thing in the parking lot at Nellis AFB. I quickly determined that the hot desert sun had cooked off one of those air cans which had blown a nice hole through my convertible top as it launched itself downrange. Luckily nobody was near it nor did I get a callsign out of that experience. I switched to an air compressor after that. A decade later I had graduated to double action airbrushes and had used several brands. I endured the reliability issues with these given that spare parts were as close as the nearest hobby shop. Even so, there came a point when I knew my lone surviving and trusty airbrush was shot and the spare parts weren't bringing it back any longer. 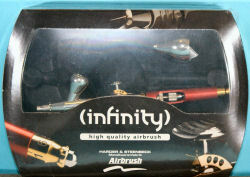 That's when I discovered there were other brand name airbrushes out there and my quest for the ideal airbrush continued. In the nearly 12 years of Cybermodeler Online, I've had the pleasure of trying out different airbrushes, several of which are now part of my workbench essentials. 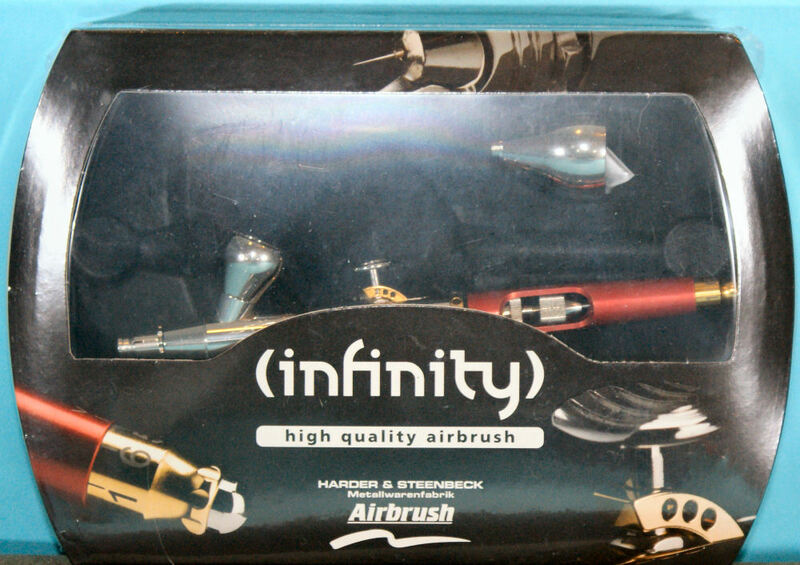 One day a few months ago, a colleague called to see if I'd heard of Harder and Steenbeck's line of airbrushes. I had not at that point, but I quickly got in touch with them and they were kind enough to send out this airbrush several weeks ago. I confess I haven't wanted to put it down long enough to write about it. Harder and Steenbeck has been around for decades, but their airbrushes have not made it into the scale modeling world until recently. 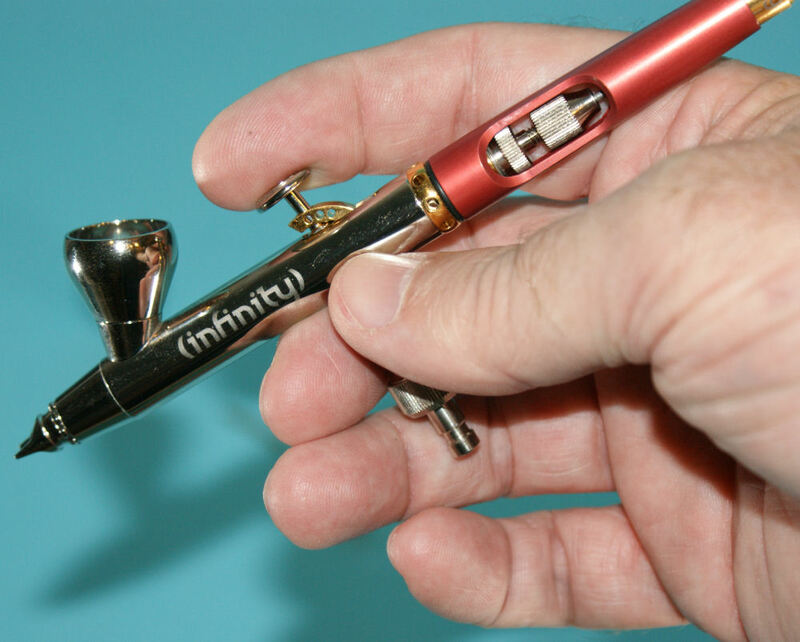 What you see here is their (infinity) Two-in-One airbrush set. It comes in a metal case, and that is already a step up from the cardboard or plastic cases in which other airbrushes are packaged. Straight out of the box, you see that the airbrush comes with an airhose quick disconnect, which was an immediate hit since I'd converted to quick disconnects on my other airbrushes. The quick disconnect is the same as those used by Iwata, Grex, and others, so you don't need a special airhose. 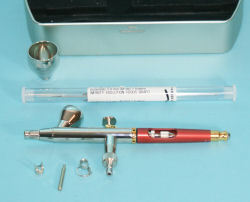 If you don't have a quick disconnect system, Harder and Steenbeck have a nice airhose available separately for their airbrushes. Moving on, my first impression was that the airbrush engineering was similar to Iwata and Grex, but was that ever wrong! The look and feel of the airbrush is similar to those guys, but the similarity ends there. The engineering of this airbrush is definitely showing its German heritage. Precision all the way! When you pull the airbrush apart, you can feel the difference. The seat of the needle is much tighter, but this doesn't affect trigger movement at all. 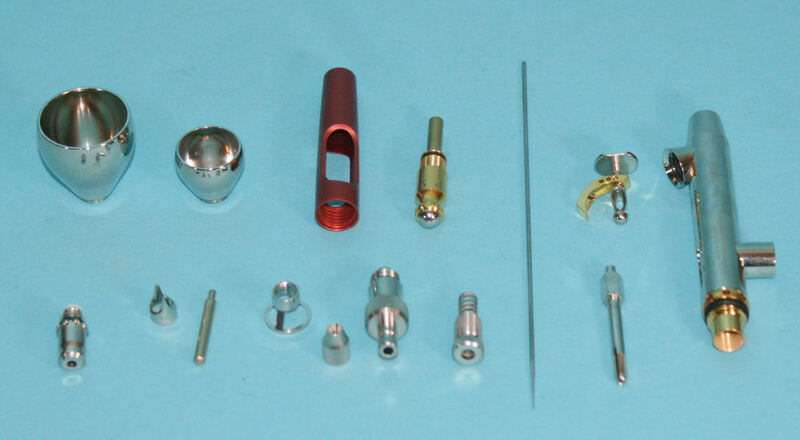 The nut in the open part of the handle allows for adjustment of the trigger pull tension. Do you want light movement or more tension on the trigger? Just dial it in. The gold knob on the back of the handle allows you to dial in the maximum trigger pull, so you can limit your needle travel to suit the level of precision you're working to achieve. All of this is great and can come right off of a spec sheet. The proof is in the operation, which brings me back to why I took so long to finish this write-up. As I mentioned above, this gem simply snapped onto my airhose so I was running different tests through it. The airbrush moves Testors enamel, thinned to the viscosity I shoot out of my other airbrushes, just fine. Ditto with Tamiya and Vallejo acrylics. The Vallejo Model Air acrylics are especially nice since you can simply drop it as much or as little directly out of the bottle. Playing with different combinations of viscosity and air pressure didn't reveal any issues. But there was one test that remained - cleaning! 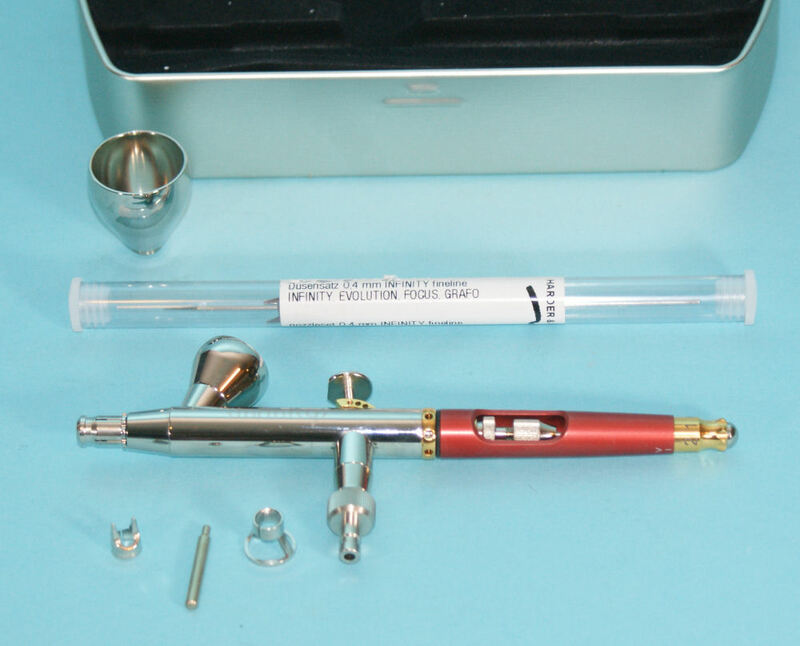 How many of you with your different brands of double-action airbrushes have had challenges getting your airbrushes back together again easily? The single-action airbrush should be a no-brainer, but some of the double actions were a royal pain, especially if you removed the trigger. I won't name any names, but those of you with those brands will understand. Iwata did something different and their triggers came out and when back together with little fuss. How could you top that? Well Harder and Steenbeck did just that. 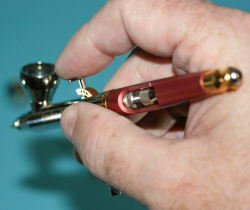 That unique-looking gold mechanism attached to the trigger stem is part of an ingenious ball-joint pivot that is now THE easiest trigger to remove and re-install. In fact, it took longer to disassemble the airbrush for the image above than to reassemble it again. The engineering, the feel, and the quality of this airbrush has made this gem my new favorite. Given the airbrushes I've looked at in the last few years, it is hard to believe anyone could do it better, but I am impressed. My sincere thanks to Harder and Steenbeck for this review sample!